If you’re not from Arizona (or southern California, for that matter), then you probably haven’t been to a lovely little restaurant called Pita Jungle. For the uninitiated, Pita Jungle serves all manner of Mediterranean-inspired dishes from cilantro-jalapeno hummus to chicken shawarma sandwiches wrapped in lavosh bread. It’s a veggie-heavy menu, and they also have a lot of items that can be modified to vegan, which is great for people like my vegan sister. My favorite item on the menu happens to be vegan as well, even if I’m not. (Hell, I had a double-double from In N Out for dinner last night.) It’s the caramelized cauliflower with tahini sauce, and it’s wonderful. Since the first time I tried it, I’ve been scheming how to recreate it at home, and I’m proud to say I’ve finally done it. I wish I could remember the first time I ordered it. Usually, cauliflower is not the most enticing vegetable, and I wasn’t fully certain if I liked tahini (a paste much like thin peanut butter, but made from roasted sesame seeds). Something about it must have piqued my interest, or maybe I just read a favorable Yelp review about it, haha. 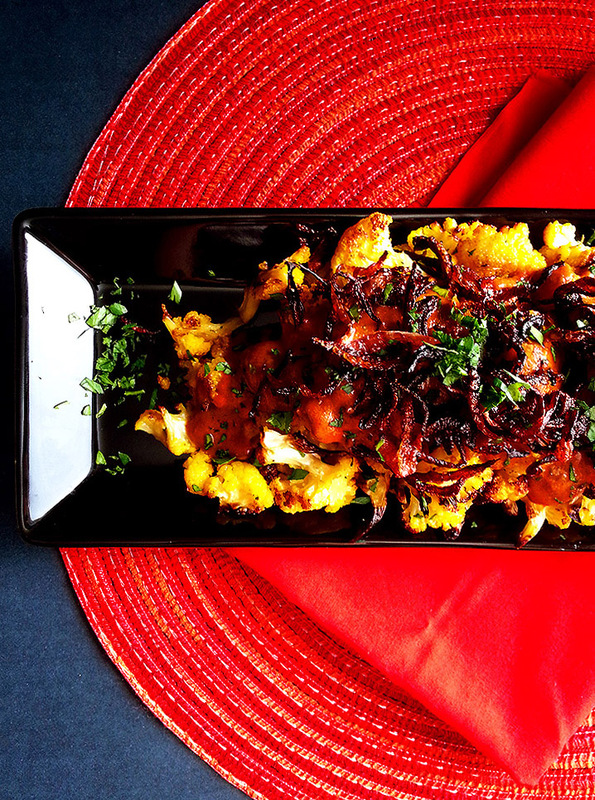 Upon being served this miracle of vegetable side dishes, you’re presented with a plate full of well-browned roasted cauliflower served with a paprika-laced sauce of tahini and garlic, all covered with a pile of savory caramelized onion strings. There’s also a smattering of pine nuts, which I left out because hello, expensive!. When scouring Google in an attempt to find a copycat recipe, I found a handful of PJ-inspired recipes, but nothing that came close to the original dish. I managed to find video of a local TV station’s morning news program wherein one of Pita Jungle’s founders cooked some cauliflower with tahini. Lucky for me, the post also included a rather bare-bones recipe for the dish, and I was off and running. While looking for cauliflower at the grocery store, I spied a gorgeous head of golden cauliflower and thought it would make a pretty addition. If you can’t find it, by all means, use white cauliflower! Preheat your oven to 450 degrees. Trim the head of cauliflower to remove any leaves and the thick stem end, rinse the cauliflower well and pat dry. Cut into thick slices and cut these slices into medium- and small-sized florets. Toss the cauliflower in a bowl with 3 tablespoons of olive oil and the salt and pepper. Place in a single layer on a sheet pan and roast in your preheated oven for 8-10 minutes. Turn on the broiler, and cook the cauliflower directly under the broiler for 5 minutes. Stir, and broil 3 minutes more. While the cauliflower roasts, prepare the onions. In a medium skillet over medium-low heat, allow half of the olive oil to heat. Once hot, add half of the sliced onion and cook, stirring often, until the onions are dark golden brown and crispy. Be careful, they can go from perfect to burned very fast! Remove the browned onions to a plate lined with a paper towel, and repeat this process to cook the second half of the onions with the remaining oil. Sprinkle the onions with a bit of salt and set aside. Reserve 2 tablespoons of the oil from the fried onions, discarding the rest. To prepare the tahini sauce: In the same skillet that the onions were cooked in, heat the 2 tablespoons of reserved olive oil over medium-low heat. Once the oil is hot, add the minced garlic along with the salt and pepper, and cook briefly until the garlic is just turning pale golden. Add the lemon juice, paprika and 1 tablespoon of the minced parsley and remove the pan from the heat. Add in the tahini. Stir well to incorporate the tahini. The sauce will be very thick, but add some of the warm water a few tablespoons at a time, and whisk into the sauce until the desired consistency is reached. Put back over low heat to warm through. Scoop the cauliflower into a serving bowl or platter and spoon over the tahini sauce. Mound up the fried onions over the top, and sprinkle with the remaining 2 teaspoons of fresh parsley. There’s nothing left to do now but dig in! I admit, over the course of a day and a half, I ate this entire pile of yummy roasted veggie goodness. I’m not sorry. It is equally fantastic on its own, as I’m sure it would also be next to some grilled chicken and a big crunchy salad. For all those Pita Jungle fans out there, you can now enjoy this amazing dish at home. You’re welcome! Thank you so much for this! I can’t wait to try it as that is my favorite dish! What about pine nuts? I didn’t see that in the recipe. I must have forgotten the pine nuts! I’m not a huge fan but if you like them, I’d toast them in a dry pan for a little bit till they’re browned, and then sprinkle them on top! Hope you like the recipe! So much yum! It’s as close to the original as you can get without going to Pita Jungle! I was nice and shared with my boyfriend. He’s apparently not a tahini fan. More for me! Thank you for this, Amanda! I’ve been trying to get this right for some time! I do know that they use something that you omitted, though. Our waitress told us that they also added sumac, which is a lemony-tasting powder made from the sumac berry, and is common in Mediterranean cooking. I’ve done it with sumac, but not as thoroughly as you describe! I can’t wait to try your recipe! How long do you wait to add the tahini? Mine seized right up! It was gross. Oh, bummer! I’m sorry your sauce seized, Ashley! When I added the tahini, the lemon juice and garlic mixture wasn’t bubbling at all, so the heat was very low. Maybe if you try it again, take it off the heat and stir the lemon and garlic mixture for a bit until it cools just a bit more, before adding the tahini? Good luck on your next attempt! Also, if it still seizes up on you, try adding a bit of water and stir until it becomes smooth again, as that might help as well!